Robert, son of Alexander Munro and Jean Lesly was born November 2, 1786 in Dornoch, Sutherland, Scotland. (1) This coastal village in the Highlands sits on the western coast overlooking the North Sea toward Norway. The seaside town of Dòrnach or Dornoch is on the north shore of the "Caolas Dhòrnaich" or bay where it opens to the east into Moray firth. The word "dòrnach" in Gaelic means pebbly which from the picture above seems to well describe the area. Interestingly Dornach was the last place a witch was burned in Scotland. Janet Horne's trial and condemnation took place in 1727. The witches stone now commemorates her death. It is inscribed 1727. These must have been highly superstitious people. ​ Robert had at least one brother Alexander,(2) who I was able to locate as well, but to date, I have found no other siblings. At some point before 1810, Robert left the Highlands and re-located to Glasgow. He married a girl by the name of Elizabeth Glasgow September 21, 1810,(3) in Gorbals, Lanarkshire, Scotland. ​ During the life of Robert Munro part or all of the family moved from Dornoch to Glasgow. As with many of the Highlanders much of the population left due to several factors. ​ After the Jacobite Rising of 1745, the Highlanders traditional way of living was outlawed and a mass migration took place. ​ Robert is shown to work as a shoemaker in the 1841 Census. (4) At that time they lived at Mckilligan's Court with four of their children and two other families. He and Elizabeth would bare seven children from their union: Alexander, Daniel, Robert, Janet, Elizabeth, Jane and John. Robert died 31 May 1858 at 3:30 pm at his home at 6 Hope St, Anderston, Glasgow,(8) from disease of the brain which he suffered for some years. He was a widower and was listed as 78 years of age on the death notice, which would make his birthday 1780 or 81. According to the 1851 Census he should only be 73, indicating that perhaps his son-in-law made an error in his report. The parents names are not listed. The doctor was George McEwan from 13 Pitt Street. The death was reported by his son-in-law Alexander Baird (husband of his sister Jane) who was not present when the death occured but lived at 6 Hope St, Andeston, Glasgow. Robert is buried in the Eastern Necropolis Cemetery, in Glasgow, Scotland. Scotland's rugged Highlands faced obstacles causing a massive migration of it's people. 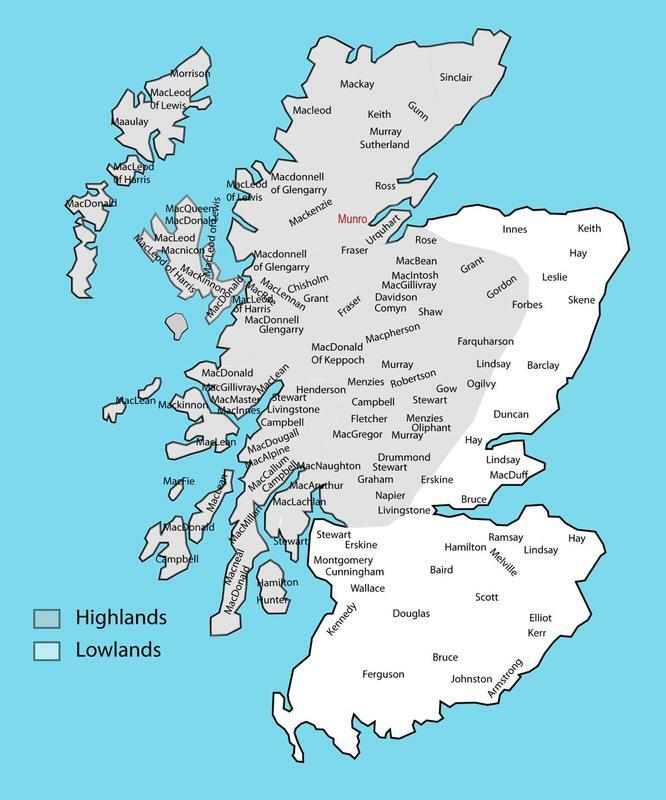 It should be noted that there were significant differences between the Highlands and the Lowlands, one in particular was language. A' GhA' Ghàidhealtachd literally means "the place of the Gaels" and traditionally; from a Gaelic-speaking point of view, includes both the Outer Hebrides and the Highlands. The attempt by Charles Edward Stuart ("Bonny Prince Charlie") to regain the British throne in 1745 for the exiled House of Stuart took place while most of the British army was in Austria fighting the War of the Austrian Succession. Charles sailed to Scotland and raised the Jacobite standard at Glenfinnan, supported by a gathering of Highland clansmen. ​ As the troop marched southward, an initial victory was claimed at Prestonpans, near Edinburgh. They continued on to Carlisle and over the border into England until they reached Derby. At that point some of the British troops were recalled forcing the Jacobite army to retreat to Inverness. Three miles east of Inverness in the moors of Culloden was where the last battle on Scottish soil would take place. The "Battle of Culloden" ended with the final defeat of the Jacobites causing Charles to flee to France. Fuadaichean nan Gàidheal, the "eviction of the Gaels". During the 18th and 19th century many Scottish tenants from the Highlands were evicted from their land due to what was know as "enclosures". This was the practise of evicting tenants on smaller farms to create larger ones. Once enclosed, use of the land became restricted to the owner, and it ceased to be *Common Land, for communal use. The farming practises changed from small farms to sheep rearing, largely carried out by hereditary aristocratic landowners who previously had status as Scots Gaelic clan chiefs. While the process took over 100 years it devastated the Gaelic culture in the Highlands. *Common land is land owned collectively by a number of persons, or by one person, but over which other people have certain traditional rights, such as to allow their livestock to graze upon it, to collect firewood, or to cut turf for fuel. ​ The transition to a factory system from handmade production methods and the introduction of machines along with increasing use of steam power were all factors in the industrialization of Britain. New chemical methods for iron production and manufacturing were all part of the changes to take place during this time. ​ Britain was where it all began, largely due to the innovative new technology of the British. The influence on daily life was dramatically changed, creating a standard of living never before seen by the general masses. ​ The actual beginning and end of the Industrial Revolution varies depending on which historian we believe, but roughly it is placed between 1760 and 1830​. ​ The mechanization of spinning in 1780 Britain was at the onset. Textile production boomed and quickly spread to continental Europe and by the 19th century reached the United States. As can be witnessed in the 1841 Census for Robert and family, women held most of the factory positions, usually in the textile trade. The girls were Power Loom Weavers, while Robert worked as a shoemaker. Elizabeth was most likely ill and not working as she died within the next few years. The factory workers days were long and they received only their Sundays off. ​ During the Industrial Revolution rural people flocked to the urban centres and cities became overcrowded and unable to house the increase in population. This created overcrowded slums with lack of clean water and sanitation. The increase in the death toll due to the inadequacies was especially noted among infants. Tuberculosis in young adults increased and cholera and typhoid were endemic. ​ A blog I wrote in September of 2016 describes my McEwan Family at the same time when they arrived from Ireland to work in Glasgow. "The Plight of the Irish - Glasgow Scotland Early 1800’s" describes the conditions they were subjected to. This would be the same for Robert Munro and his family. At the time I was unable to find much on the Munro's and Stevensons but now I have made a connection. ​ During the life of Robert Munro part or all of the family moved from Dornoch to Glasgow. As with many of the Highlanders much of the population left due to the above factors. ​ After the Jacobite Rising of 1745, the Highlanders traditional way of living was outlawed and their land taken. Many movedto urban areas in search of work. The Highland and Islands area today is one of the most sparsely populated areas in Europe and is less than one seventh of Scotland as a whole. 1. "Scotland Births and Baptisms, 1564-1950," database, FamilySearch (https://familysearch.org/ark:/61903/1:1:X18R-VW5 : 8 December 2014), Robert Munro, 02 Nov 1786; citing DORNOCH,SUTHERLAND,SCOTLAND, reference , index based upon data collected by the Genealogical Society of Utah, Salt Lake City; FHL microfilm 990,561. 2. "Scotland Births and Baptisms, 1564-1950," database, FamilySearch (https://familysearch.org/ark:/61903/1:1:X18R-GZ9 : 8 December 2014), Alexander Munro, 20 Oct 1784; citing DORNOCH,SUTHERLAND,SCOTLAND, reference , index based upon data collected by the Genealogical Society of Utah, Salt Lake City; FHL microfilm 990,561. 3. Scotland Marriages 1561-1910 Transcription Marriage Find my Past URL of this page: http://search.findmypast.com/record?id=R_694829302/2&_ga=1.153116080.925679117.1460019614. 6. "United Kingdom, Merchant Navy Seamen Records, 1835-1941," database, FamilySearch (https://familysearch.org/ark:/61903/1:1:KC3W-GYQ : 5 August 2017), Robert Munro, ; From "Merchant Navy Seamen1835-1941," database and images, findmypast (http://www.findmypast.com : n.d.); citing BT 112-116, 119-120, series BT113, The National Archives of the UK, Kew, Surrey. 7. "United Kingdom, Chelsea Pensioners' Service Records, 1760-1913," database with images, FamilySearch (https://familysearch.org/ark:/61903/1:1:V5HT-PQ6 : 17 August 2017), Robert Munro, ; from "Chelsea Pensioners' Service Records 1760-1913," database and images, findmypast (http://www.findmypast.com : n.d.); citing WO 97, The National Archives, Kew, Surrey. 8. 1858 Statutory Deaths 64/408 0471, District of Anderson in the Burgh of Glasgow. **According to Ethnicity in Ancestry DNA, I am 46% from Ireland and Scotland, (Scotland being the more prominent), 27% Great Britain, 19% Western European Belgium, France, Germany, Netherlands, Switzerland, Luxembourg, Liechtenstein. This would be consistent with my family findings so far.